Life as we know it: A bit of what we are doing here in Mazatlan. 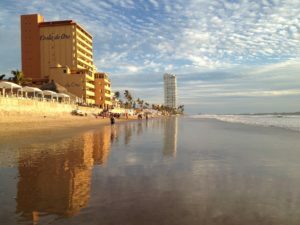 You are here: Home / Help-Project Blog / Life as we know it: A bit of what we are doing here in Mazatlan. Hey all! I figured it was time to let you in on a few things brewing, (besides the amazing Mexican coffee I drink every morning). Sorry couldn’t pass that one up! 5:30 am Emily wakes up… Such an early riser! 7:00 am Ben wakes up! See the difference? When I wake up I immediately make coffee, and we enjoy breakfast together. Mornings are for exercise, so that’s when I get my sweat on. Wow! With the bit of extra humidity, I do sweat. I’m enjoying my jogs along the boardwalk at the ocean. We walk a lot, and this is our neighbourhood. Classy huh? This is Mexico! Beyond these downright dirty, smelly, loud streets are really nice people, cheap limes, and a beautiful ocean one block from our house. Our Home street is super quiet with very interesting and beautiful people and perhaps we might do a video tour of our home? You never know. School hasn’t been very strict lately, so mornings have been for doing math for both grades, some reading, but keeping it chill. Some times the kids play math games on their devices, and other times we’ve brought home work to the Church if we need to be there. We will however have to make sure that the kids get enough studies in before March as my bro and his family are coming to visit. Yippee! Can’t wait to show them here. Most of our days are spent doing errands, grocery shopping, we go to the beach, head out to various feeding and ministry programs that the vineyard is a part of. Most of our time as of late is Darryl sitting in front of his computer doing web design for the church. The leaders of the Vineyard are super excited that we are here. They’ve been praying for someone to come along that can help them with their website. In comes Darryl. One of the pastors said that its their prayers, and their fault we are here. Who’s really keeping track? We honestly had no idea what we would be doing down here when we made the decision to come, and now the pieces are finally coming together for us as a couple. So back to The Vineyard ministries website, you’ll see its a bit dated, and could use some tender loving care. 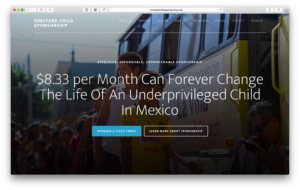 The Vineyard ministries relies on donations to keep their awesomeness going, so it’s in the plan to truly show their web visitors just how important their work is for the children, and families of Mazatlan. Will keep you updated, when Darryl has something up. I’ve been spending some of my time on Pinterest, working for the church. Yeah I know hard work…. Fill you in on that another day. Can I just say how much I miss Home magazines? Thankfully Pinterest keeps my creative juices going. Anyways, we feel more settled, especially at church. For awhile there it was hard feeling like the new Fam in town. I’m even going to the women’s retreat next week at church, which will be interesting. The average age attending probably will be 65, so I’m sure somehow I’ll walk away with decades of faith, wisdom, and promises from God, and maybe even an awesome manicure. Who knows? Anyways, will let you go. We appreciate your prayers, and financially we can’t do this without you. Thank you again to those who have helped us out. Extremely humbling. God bless you! Prayer requests: Continue to pray for Ben and Emily. Even though our kids Are having a blast, Ben asks regularly “why did you bring me here? “. It’s hard, he’s only seven. He greatly misses his complex friends and his cousin Jack. All we can do is show him the child sponsor ship website that Daddy is working on.. For .30 cents a day you and I can change a child’s life and break this awful cycle. Ben- that’s why. You’ll appreciate this experience when you’re twenty. Darryl, Jodi, Emily and Ben! Thanks for the update guys! We can’t wait to come see you. We are all really looking forward to your visit!